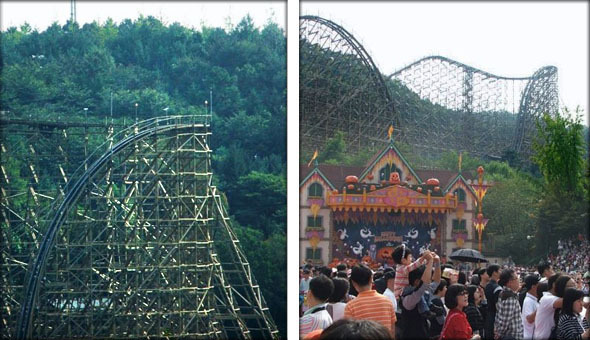 I visited Everland in South Korea late last fall, and the main attraction there was the T-Express, this gigantic wooden roller-coaster. I have to be honest, I’m no coaster expert, so I was very surprised to find out that it was supported with wooden base. Initial thoughts? Not safe! But hey, there are people sitting on it, and they’re either having so much fun, or just scared to death screaming their lungs out. Probably both. Some stats for the coaster-freaks. Length: 5383’ 10”. Height: 183’ 9”. Drop: 150’ 11”. Inversions: 0. Speed: 64.6 mph. Max Vertical Angle: 77 Degrees. The ascend towards the first drop was the one final chance you’ve got to say your last prayers. After that, we accelerated and zoom! It was hard to do anything else but scream! Great fun! The video starts with an overview of the wooden coaster. If you want to skip straight to the first-person view of the ride, go to 2:45. And just recently I found this great list on the world’s best roller coaster. Oh good Lord! T-Express couldn’t hold a candle to these monsters!